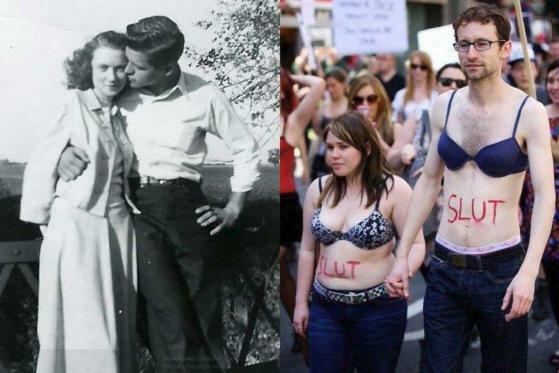 What is Present Society trying to say here ? Lol. Hyperbole much? What other species is neck and neck with us and about to kick us off the list as the most dominant species? And what does that have to do with those two pictures you posted? I always ask myself when people fearmonger like that, "If we're losing, then who's winning?". It really puts their "We're doomed!" spiels into context. Yeah the amount of cognitive dissonance needed to even suggest this OP is outstanding... Don't they realize that no matter how much negativity they read in the news that we are looking at one of the least violent periods in ALL of human history? But if they had their way they'd tear it all down, which would directly result in all the violence escalating again. And then to prove this ridiculous "theory" of theirs it always comes down to posting anecdotes of people behaving in ways they disprove (see the post 2 above ours that kicked this convo off between us for a perfect example).
" What other species is neck and neck with us and about to kick us off the list as the most dominant species? " No other Species , we will cause our Own Extinction if we continue on the Present Path we are on Now . Maybe they don't know what "civilization" means? Or practically anything about history? I'd rather be in 2018 America than in 1918 America any day because they were far less "civilized" back then. Back then, they still had human zoos, minstrel shows, WW1, legally enforced racial segregation, "lynching postcards", the 1918 global flu pandemic that ended up killing 50-100 million people, crappy healthcare, crappy labor laws, no real social safety net, etc. The fact that we can sit around in our leisure time or while on the clock and chat w/people around the world about whims like this is proof enough that civilization isn't dead. And by that, I mean that if we were living "hand to mouth" in lawless, poverty stricken regions of the world, we could rightfully complain that civilization was dead or dying. But it's pretty ridiculous to be living in highly developed countries while enjoying modern amenities, yet complaining that civilization is dead. How so? Healthcare, medicinal knowledge, and nutritional knowledge are at the highest level they've ever been and they're only improving. The standard of living today is higher than it's ever been globally, and that's improving too. The amount of food produced is at its highest levels, the amount of knowledge available to the masses is at its highest, and the global human lifespan is at its longest. People can now have successful heart and lung transplants. How amazing is that? And did I mention that the global population continues to skyrocket? How are we on the path to extinction when there are more humans now than at any other time in humankind's history? That would be like saying that flies in Australia or rats in NYC are going extinct because they're numbers are increasing so much... ETA: To put this in perspective, it supposedly took all of recorded history up until 1805 for 1 billion humans to have been born (HERE). But we're at 7.5 billion now and with no end in sight. Biological Warfare , Nuclear Weapons , Meteor of Comet Impact , Pole Shift , ..........you get the Idea Now ?